Tom Konrad offers a detailed analysis, comparing the risks and benefits of home solar with two of the biggest mutual funds. The situation made the question deeply ironic. The woman asking me was trying to help people invest in solar systems through Solarize, a nonprofit, community-sponsored group buying and discount program. Our town of Marbletown, New York and the neighboring towns of Rochester and Olive have just launched Solarize Rondout Valley, a campaign open to residential and commercial building owners in Ulster County. Solarize campaigns are designed to make it easier and cheaper to go solar. While defensive stock market investments are my specialty, I can't think of a single financial investment that combines the expected high returns and relatively low risk of a home solar system. Just like buying value stocks when they are cheap, buying your solar system at a discount through Solarize or a similar program only increases the expected returns while lowering the risk. Solarize Rondout Valley offers a 14 percent discount compared to installers' standard prices. The installers can afford this discount because volunteers help them reach new customers. Customer acquisition costs make up nearly 17 percent of the cost of a typical home solar system. The customers benefit because it boosts their returns. Even New York state and the federal government benefit, because lower prices reduce the size of tax credits, which are currently 25 percent and 30 percent of the purchase price of the solar system, respectively (capped at $5,000 for the state credit). It turned out that my fellow volunteer had a roof she thought would be great for solar, but was hesitant about signing up herself. I told her solar was one of the best investments I know of for a financial crisis, because it will still be generating the same amount of electricity and savings, no matter what the markets do. And I asked her what sort of payback she thought she was getting from her mutual funds. Two minutes later, she was our next signup for a free home solar assessment. If you finish this article, live in Ulster County and own a home without solar, I'm betting you will be our next registrant. But even if you don't have a Solarize campaign going on near you, this article should give you the tools you need to evaluate any installer's bid as a financial investment. 1. Expected return, or how much you expect to make on your investment. 3. Liquidity/cash flow: Can you get your money back when you need it? Many professional investors, including myself, also focus on the moral aspect of our investments, but I will not focus on that variable here. If you think it's important to promote your local economy or reduce carbon emissions, it's clear to just about everyone that a home solar installation is the best choice. The financial comparison is a lot less readily discernible, so that is what I will focus on here. There are more mutual funds than anyone can count, so, for simplicity, I will focus on two that readers are most likely to own. According to Investopedia, the two biggest mutual funds this year are the Vanguard 500 Index Fund Admiral Shares (VFIAX) and Fidelity Government Cash Reserves (FDRXX). These funds hold more investor money than any other mutual funds. Even if you do not own either of these funds, most investors own something similar. VFIAX is a stock market index fund, designed to mimic the return of buying a proportionate share of the entire market. For the purposes of this analysis, most funds that contain the words “stock market index” in their name will have substantially similar investment characteristics. If it makes sense for you to sell VFIAX to invest in home solar, it will make sense to sell any of these other stock market index funds for the same reasons. FDRXX is a money market fund, and almost every investor owns some money market or short-term bond fund in their portfolio. If it makes sense for you to sell FDRXX to invest in home solar, it will make sense to sell any of these other money market or short term bond funds for the same purpose. The economics of home solar vary widely depending on local and state incentives, future local electricity prices, installation cost, local climate and the angle and degree of shading of your roof. In my experience, a reputable local installer is likely to give you reliable estimates for all of these except for future electricity prices. As examples, I will use two fairly typical installations using prices from Solarize Rondout Valley. The first system is a best-case scenario, installed on a house with a large, open section of roof with moderate tilt oriented at least a little south and with limited shading. A 5-kilowatt installation using 18 panels and 320 square feet of roof space will cost $3 per watt ($15,000) before state and federal tax incentives at the discounted Solarize price. The New York state tax incentive is 25 percent of installation cost up to $5,000, while the federal Investment Tax Credit is 30 percent, so the net cost after incentives for this installation will be $6,750. Because of the orientation and limited shading, this array will produce about 1,300 kilowatt-hours per year, per installed kilowatt (6,500 kilowatt-hours total) in Ulster County. Call this System A. On the other end of the spectrum, consider a 7-kilowatt array on two sides of a building with the panels facing due east and west, and with some shading. The customer has high electricity usage and wants to get as much production out of the given roof space as possible, and so opts to use 19 of SunPower's (SPWR) highly efficient 360-watt AC panels using only 340 square feet of roof space. Each of these panels has its own microinverter to best handle the shading. While this installation will probably still produce 7,000 kilowatt-hours per year (1,000 kilowatt-hours per year, per installed kilowatt) despite the less-than-optimal conditions, the premium SunPower panels will cost $4 per watt, or $28,000 before tax incentives. After tax, the system will cost $14,600. Call this System B. 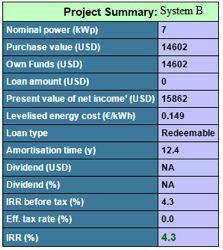 To find out the financial returns, we also have to make assumptions about the price of electricity saved. I will use 14 cents per kilowatt-hour, increasing at a rate of 1 percent for the next 25 years. This is more conservative than most installers' assumptions of annual electricity price increases of 3 percent or more, but I find it pays to be conservative when making investment decisions. With these assumptions, we can use an online return calculator such as PVCalc. Below are the assumptions for System A, as I entered them into PVCalc. I assumed a 25-year life, 1,300 kilowatt-hours produced and skipped the “own consumption," as well as "feed-in tariffs" and "tax" sections -- which do not apply in New York state. 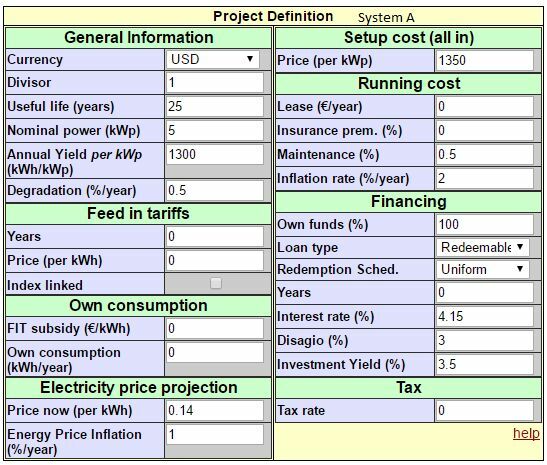 Setup cost is the cost per kilowatt after tax incentives ($6,750 for 5 kilowatts), and financing is 100 percent the customer's funds, because we are considering selling a mutual fund to pay for the system. 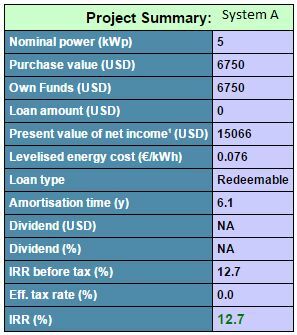 PVCalc gives the following results for System A.
I think the most useful factors here are “levelized energy cost" and internal rate of return (IRR). The levelized energy cost of 7.6 cents per kilowatt-hour is far below the price we pay for retail electricity in New York. IRR is a financial measure that allows us to compare the system on an apples-to-apples basis with fixed price investments that bear interest, such as CDs, bonds and money market funds like FDRXX. An IRR of 12.7 percent is a better return by far than you can find on any investment available to the retail public. The economics of System B are less attractive because we're paying for an additional panel and more expensive panels in order to produce only a little more electricity than System A on a suboptimal roof. Still, System B may be a better bet than many mutual funds. Here are the results from PVCalc. You will note that the levelized energy cost is close to break-even at 14.9 cents compared to the 14 cents, plus the 1 percent annual increase I used for this scenario. That said, the IRR is 4.3 percent, meaning that it is still worth considering selling a money market mutual fund like FDRXX to buy this system. FDRXX has a yield of just 0.1 percent. So as long as the risks and limited liquidity of a home solar system (discussed below) are acceptable to you, it will make financial sense to sell a money market mutual fund like FDRXX to buy System B. It is more difficult to gauge the expected return of a stock market mutual fund like VFIAX, but over 25 years, it is possible to come up with some reasonable estimates. Since we are looking at a 25-year life of the solar system, we should consider a similar time period for our mutual funds. Historically, long-term stock market returns have been driven by the valuation of the stock market at the beginning of the period. One widely used valuation measure is Robert Shiller's cyclically adjusted price-to-earnings ratio (CAPE). The CAPE is currently high by historical standards, meaning that stock market and VFIAX returns for the next 25 years are likely to be below par. Extremely long-term stock market returns have been in the 9 percent to 10 percent range, but a CAPE this high has usually preceded long periods where returns have much lower, like in 1929 and 1966. The CAPE was even higher in 2000, and stock market annual returns have been around 3 percent over the past 17 years. With these past results as a guide, we can expect long-term stock market returns to be between 3 percent and 8 percent over the next 25 years. From this we should subtract the expense ratio of a mutual fund, which is a negligible 0.1 percent for VFIAX, but could be much higher for other stock market mutual funds. We should also reduce the return to reflect the expected tax on dividends and capital gains of about 15 percent. All together, the expected return for VFIAX is between 2.5 percent and 7.5 percent. People in high income-tax brackets should reduce these expected returns even further. If you are worried about future stock market returns, even the mediocre 4.3 percent expected annual return from System B looks good against a 2.5 percent after tax return for VFIAX. If you are a stock market optimist, you should jump at the chance to sell VFIAX if you can get the expected 12.7 percent annual return from System A, but you will probably find System B less enticing. Expected return is not the only consideration; we also need to consider risk. Stock market mutual funds like VFIAX are known to be risky, and in the next 25 years, we can reasonably expect to have one or two financial crises like we saw in 2001 and 2008. Given the high CAPE ratio discussed above, a bear market in the next few years seems more likely than not. Over long periods, the stock market does tend to make up for past losses, so a 2.5 percent annual return for VFIAX over the next 25 years is a reasonable worst-case scenario. The attraction of a money market mutual fund like FDRXX is the limited downside. The fund should be able to pay its 0.1 percent interest without losing value (at least before inflation) over the next 25 years. The biggest risk for FDRXX is actually inflation itself. If inflation accelerates, and short term interest rates do not keep up, the real value of FDRXX will fall faster than the dividends it pays can make up for. Even if dividend payments rise to keep up with higher inflation, these are taxable, and they are very likely to continue to fall short of inflation after tax. Given the the country's high debt, and the Trump administration's stimulus plans, rising inflation is quite possible. If it does rise, the interest paid to holders of FDRXX should rise with it. Since that interest is taxable, rising inflation will lead to small net losses for holders of FDRXX. Unlike FDRXX, a solar installation should benefit in the high-inflation scenario, since electricity prices and savings should rise with inflation. Nor should a prolonged stock market downturn hurt the returns from a solar installation. Another way to put this is that, as investments, solar installations have the attractive property of holding their value when financial investments are falling. This makes investing in even a relatively unattractive solar installation like System B a good way to diversify a larger investment portfolio. The main risks for solar installations are falling electricity prices, the chance that the system breaks down, and the chance it is damaged in a house fire and insurance does not cover its replacement. There is also regulatory risk: the chance that regulators may change the way solar owners are paid for the electricity they generate. Lower electricity prices equate to lower savings from solar. Most people assume that electricity prices will continue to rise over the long term, as they always have in the past, but this may not be a valid assumption. The falling prices for renewables and, perhaps most importantly, natural gas have been causing electricity prices to fall in recent years, and renewable energy technologies like wind and solar are almost certain to continue their price declines. 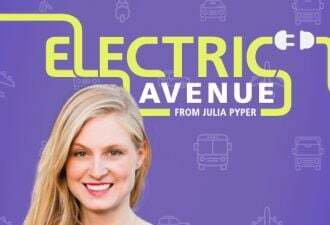 These price declines are likely to be at least partially offset by the need to repair and expand our aging electric transmission and distribution infrastructure. How these two trends will balance is hard to predict. A scenario where we see electricity prices continue to fall as fast as 1 percent per year seems quite possible. If we put this 1 percent annual decline into PVCalc, the IRR of each system falls by 2 percent. The IRR for System A becomes 10.7 percent, which is still pretty hard to beat. The IRR for System B falls to an unattractive 2.2 percent, but this is still better than we can expect from a money market mutual fund like FDRXX. Most home solar systems come with warranties. Solar panels usually have a 25-year power warranty that guarantees that electricity generation will not fall too much faster than expected. The expected return calculations already account for some degradation, the rate of which is specified in the “degradation” field of PVCalc. The rest of the system usually carries a 10- to 12-year product warranty, and the electricity produced in the first years of a solar system is the most important in determining the expected return. If, for instance, in the highly unlikely case that System A were to break down and be completely worthless after 15 years, we can see the effect on return by putting 15 into the “useful life” field. In this case, the IRR of System A falls only to 10.2 percent from the initial 12.7 percent, still a far better return than we should expect from a stock market mutual fund over the next 15 years. Part of the reason System B was more expensive was that it was made with SunPower AC panels, which come with a comprehensive 25-year warranty on all of the expensive system components. Hence, if System B were to fail during the 25-year useful life I assumed (and it will likely last longer), it could be fixed under warranty. Including an annual insurance premium of 0.5 percent of the initial system cost reduces the expected return for System A to 11.2 percent. In that scenario, the expected return for System B changes to to 4.0 percent from 4.3 percent, so the cost of insuring against property damage to a solar system is manageable. Such insurance makes sense if the solar system is accounts for a significant portion of your net assets. In the stock market, companies often deal with regulatory risk. Large importers like Walmart are worried about President Trump's proposal for a “border adjustment tax,” because it would increase their costs. A recent petition filed by bankrupt Suniva with the International Trade Commission could result in a 40 cents per watt tariff levied on solar cells imported into the U.S. This worries solar financiers and residential solar installers. The recent rise of stock market index mutual funds like VFIAX since the election also has to do with regulation, namely, the anticipation that regulations will be reduced and businesses will become more profitable. If those reforms fail to happen or the profits fail to materialize, the market and mutual funds will fall. Regulatory risk can also affect the value of a home solar system by changing the expected future payments. Net metering and other payment structures to compensate homeowners for the power they send to the grid are created by state regulators, and what regulators give, regulators can take away. Although state utility commissions have a great deal of power to change rates, they are generally appointed by elected state officials. As such, they are subject to political pressure, and usually avoid actions that will be unpopular with a large number of voters. Yet they also have a mandate to ensure the financial stability of the utilities they oversee. This can lead to unpleasant surprises for solar customers if utilities persuade regulators that their financial health is at risk. The most stark example of regulatory risk for solar was when the Nevada Public Utilities Commission reduced solar customers' payment for net excess generation by three-quarters in December 2015. The commission also tripled fixed charges -- and retroactively applied all of these changes to existing solar customers. For someone considering investing in home solar today, it is the fact that the change was retroactive which should be most disconcerting, since the possibility of a future retroactive change makes it impossible to accurately estimate the future returns for solar. Any possibility for a retroactive change should concern homeowners considering going solar, but the Nevada example should be comforting to many. This is because it is the exception that proves the rule: No other state regulator has ever retroactively reduced payments for existing solar customers. Moreover, the public outcry was such that the retroactive aspects of the ruling were eventually reversed. Although regulatory risk is generally low for home solar, it does vary from state to state. The safest states are those like New York that have recently reached decisions regarding the compensation for home solar. The New York PSC recently ruled that existing residential solar customers could keep net metering for the life of their systems, while homeowners who install solar over the next five years would benefit from net metering for 20 years. The certainty of receiving net metering rates for 20 years should be sufficient for New York homeowners to make an informed investment decision. Most homeowners should be fairly confident that whatever rules apply to their system at the time it is installed will last (at least for them) a long time. But there is still some chance of retroactive changes. The reason the Nevada regulators' action was so drastic was that the rapid growth of solar caught them by surprise. State regulators that are currently planning ahead for the time when solar takes off in their state should be able to manage a more orderly transition to new rules that adequately address both the costs and benefits of adding large amounts of residential solar on the grid. All told, regulatory risk should be less of a worry for home solar customers than for owners of stock market mutual funds like VFIAX. Money market funds like FDRXX have minimal regulatory risk; however, it is even less than that of solar. If you are considering selling a mutual fund, opportunity cost is the risk that it will go up in price after you sell. Nobody likes to sell today, only to find that they could have sold for a lot more at a later date. Conversely, the opportunity cost of not selling a mutual fund is that the price of the fund may fall before it is sold. For a homeowner installing solar, opportunity cost is the risk that the cost of home solar installations will fall after they sign the contract. The opportunity costs of not installing solar are that the cost to install a solar system might go up, or that the compensation and incentives may fall. Although the costs of solar installations have been declining over the long term, in the shorter term, prices seem more likely to rise than fall. The Suniva petition mentioned above could add 40 cents per watt to the cost of solar cells manufactured outside of the U.S. within the next year. Since the U.S. no longer has a significant manufacturing base, that cost will directly increase the cost of a solar installation. The Trump administration and Congress are also planning on tax reform in the near term. The largest solar incentive, the 30 percent Investment Tax Credit (ITC), could be a target for cuts in order to pay for Republicans' tax priorities. It is very unlikely that tax reform will be retroactive, so solar installations completed in 2017 should still be able to benefit from the ITC. Even if the ITC is not cut as part of tax reform, it is currently scheduled to phase out between 2019 and 2021. State incentives for solar may also decline in the near term. In New York, the NY-Sun state incentive for solar installers is set to decline from its current 40 cents per watt to 20 cents sometime this summer. Your solar installer should be able to tell you what is happening with incentives in your state, although what they say should be taken with a grain of salt, since they have an incentive to exaggerate any upcoming declines. There are also other resources. DSIRE, for instance, offers a comprehensive database for both state and federal renewable energy and energy efficiency incentives. Finally, for people in my home Ulster County or nearby Orange County who are currently or about to sponsor group buying discount campaigns like Solarize, these campaigns only run for three months. The discount will end on July 31 in Ulster County and September 1 in Orange County. All told, the medium-term trend for the cost of a home solar installation is likely to be up. While the price of a money market mutual fund like FDRXX does not change over time, the price of a stock market fund like VFIAX will rise or fall with the market as a whole. Two widely used methods for evaluating the near-term risk/reward of the stock market are the CAPE ratio discussed in the expected return section and the VIX, or Volatility Index. The CAPE ratio is currently high by historical standards, meaning that the risk of a stock market decline is greater than usual, while the chance of the stock market going up in the near term is lower than usual. Conversely, the VIX is usually high when stock prices are low, and low when stock prices are high. In mid-May, the VIX was trading around $10.50, which is lower than it has been at any time in the last 10 years. It is currently lower than it was at any time since before the financial crisis in 2008. As the VIX fell to its recent low from a 2008 high, VFIAX has risen 167 percent, or a compounded 12 percent per year for the last eight and a half years. In terms of timing and opportunity cost, taking money out of mutual funds and putting it into solar seems like an excellent risk/reward tradeoff in June 2017. The biggest downside for a home solar installation is liquidity. The only way to get your money out of a solar system is to sell your home, or wait for it to come back to you over time in utility bill savings. The great virtue of mutual funds is that you can sell them and get cash within 24 hours. If you expect to need the money you have in mutual funds in the next few years, you are better off using some other sort of financing such as a loan to pay for your solar system than selling your mutual funds. For a homeowner looking for a long-term investment, or one with money in mutual funds looking for more attractive investments, home solar is an excellent choice. For many homeowners, it offers very attractive returns compared to almost any mutual fund. 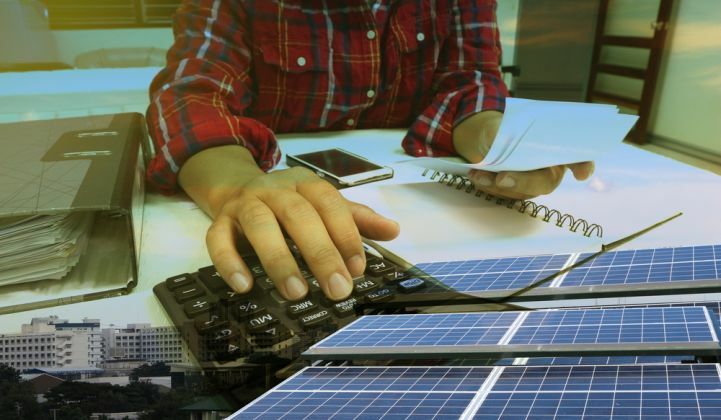 Since every solar installation is different, finding that expected return is best done using a dedicated solar or other financial calculator, such as PVCalc. While a higher expected return is often a good reason to invest in solar, there are usually other important considerations. People who expect to need the money they are investing in the next few years should avoid difficult-to-sell investments like solar. Stock or equity mutual funds are generally considered much more risky than a home solar installation. Gains from mutual funds are taxable, while electricity bill savings from solar are not. Current stock market indicators show greater-than-usual risks and lower-than-usual potential rewards. While the price of solar is likely to decline over the long term, recent sharp declines and political and regulatory risks mean that solar installations could easily become more expensive over the next few months or years. You may not own a home, or your roof may be shaded, in need of replacement, or otherwise unsuitable for solar. If it is, a reputable solar installer will tell you so. If your roof is right for solar, there may never be a better time to sell your risky mutual fund and put it in something that is as safe as houses: a home solar system. Tom Konrad is the manager of the Green Global Equity Income Portfolio.